Dog ear infections can be frustrating and tricky to treat. Here are some tips to getting that painful disease under control as quickly as possible. Unfortunately, there are no over-the-counter ear treatments that treat specific infections. Most of the treatments contain alcohol and acids. These may be effective for mild infections, by acidifying and drying the ears. They also physically clean the ear canals of debris and organisms. But, if these are not effective after 7 days, flushing the ears twice daily, it’s time to see the vet. 1) Ear Cytology– It’s important to know what your dog’s ear is infected WITH. Dogs can get yeast infections, bacterial infections (different kinds of bacteria), and combinations of both yeast and bacteria. Because yeast and bacteria need to be treated with completely different medications, it’s very helpful to know which you are dealing with. Also, different kinds of bacteria respond better to different antibiotics, while some types of bacteria are developing resistances to the commonly used. The only way to know what organisms are present is an ear cytology. It is impossible to determine whether an infection is yeast or bacterial by the odor or characteristics of the discharge! The microscopic characteristics of the organisms guide your veterinarian as to the best first choice of medications. 2) Removing debris from the ear canal is very important to success. If the debris is not removed, you will be putting medication on the surface of the debris and it may never get to the skin surface to kill off the organisms causing the infection. Also, some medications are inactivated in the presence of pus! If your dog has a lot of debris in the ear, you r vet should recommend either an out-patient ear cleaning or a Deep Ear Cleaning under anesthesia. 3) Treatment of the infection. Your veterinarian will make a treatment plan depending on the type of infection, amount of discharge present, amount of inflammation and secondary changes deep in your dog’s ear, and possible underlying causes. Flushing/ Cleaning– Choice of flush sloution recommended depends on the factors above. ** TIP 1: With your dog sitting or standing, point his nose to the ground while instilling the flush solution. ** TIP 3: Get it down in there! Insert the nozzle of the flush down into your pet’s ear as far as it will go. (But don’t make an airtight seal!) You can’t come close enough to the ear drum to hurt it! But, if you don’t get the nozzle down in the ear, you won’t get the flush in deep enough to clean the canals! 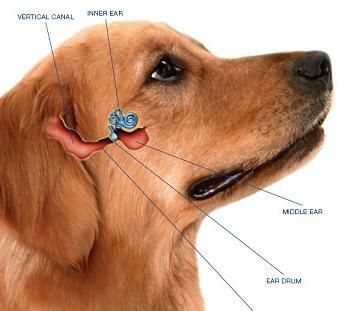 Remember that the dog’s ear canal is “L” shaped. 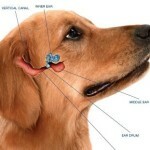 The medication has to go down from the ear opening to the point of the jaw, then dive in toward the middle of the head. ** TIP 4: Do this Outside! After a good massage, let your dog shake his head! It’s messy! Wipe the excess away with a tissue/ towel. ** TIP 1: While your dog is sitting down or standing, point his nose toward the ground when you instill the medication. This orients the ear canals to allow the medication to run deep into the canals, rather than right back out. ** TIP 2: Like flushing, insert your medication nozzle all the way into the ear. ** TIP 3: Shaking is inevitable! Stand back! 4) Treat the Underlying Condition in cases of recurrent, persistent or long term conditions. This may mean some additional testing is needed to determine the underlying condition. 5) Rechecking with your vet is critical! Only your vet can look deep into the canals with an otoscope to tell you whether the infection is cleared up all the way to the ear drum. I know it costs money, but the number 1 cause of “recurrent” or “persistent” ear infections is not getting the infections completely resolved. Don’t get lulled into a false sense of security just because you don’t see any discharge or smell any odor! That infection could be lurking at the bottom of the canal, taking it’s sweet time crawling it’s way back up to the opening! Approximately 65% of ear infections need treatment for longer than 2 weeks. Sometimes owners need to treat more deeply than they originally were. Sometimes, there is too much debris in the canal for the medication to be effective so the ears need a Deep Cleaning under anesthesia with a scope to visualize that the canals are, indeed, clean to the ear drum. The infection may have broken through the ear drum into the middle ear, requiring special treatment. Sometimes, the infection changes invaders– one organism is killed off, leaving room for a new one to grow (a repeat cytology reveals story). There be a colony of resistant bacteria that require specialized medications (identified by culturing the ear debris). Often, there is an underlying cause for the ear infection in the first place: inhaled allergies, food allergies, hypothyroidism, etc. These must be addressed or the infection won’t resolve or will recur. Have an ear cytology done first. Have the ears cleaned according to your vet’s recommendation. You may have to continue using a cleanser at home during treatment. Use the appropriate medication aimed at your pet’s infection. Hold the nose down. Insert the medication bottles fully into the ear– you can’t hurt your pet’s ear canal! Keep the recheck appointments until the infection is gone. Explore possible underlying causes or additional testing if the infection is not clearing up appropriately.